Former Republican Presidential candidate and CEO of Godfather's Pizza, Herman Cain, introduced Republican Congressional candidate Erika Harold at a recent fundraiser in Brentwood, MO. Cain has endorsed Harold in her attempt to unseat incumbent Republican Rodney Davis in Illinois's 13th Congressional District. Harold is running against incumbent Republican Rodney Davis. Their primary is coming up on March 18th. Watch Herman Cain's complete remarks. Watch Erika Harold's complete remarks. Yesterday, U.S. District Judge John Gleeson heard arguments from retailers and the two big credit card companies, Visa and MasterCard, about a proposed settlement that would award retailers about $7.2 billion in their class action lawsuit. In anticipation of that hearing, Professor Todd Zywicki wrote an op-ed for Forbes arguing for the settlement. Zywicki argues that it would help end years of frivolous legislation from the retailers. In this video, I interview Professor Zywicki about his Forbes article and the details of the settlement. 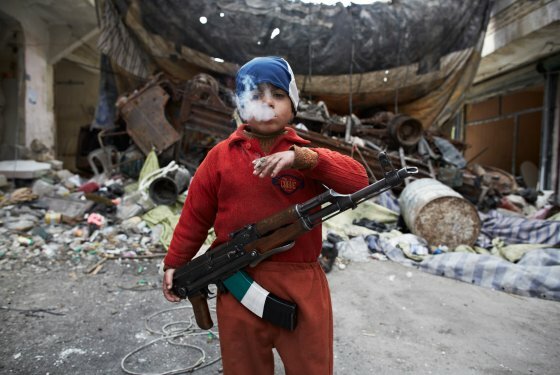 The photo, taken by Sebastiano Tomada, shows Ahmed, the eight-year-old son of a Syrian rebel fighter, smoking and standing guard with an AK-47 outside a barricade in Aleppo. That's the face of our Syrian "allies" and every Chicago third grader is now wondering when he gets an assault rifle and pack of smokes courtesy of the American tax payer. I mean, if it's good enough for our "friends" surely we wouldn't want American children to go without. It's troubling that our "allies" employ child soldiers. Didn't then Senator Barack Obama co-sponsor legislation in 2008, later signed into law, to prohibit America from sending money and material to countries using child soldiers? Yes, yes he did. It passed the House and Senate unanimously. There were a lot of abstentions, but no one in either House of Congress voted against it. As president, Obama has repeatedly waived that law. Apparently, he opposed the use of child soldiers before he supported it which may explain why John Kerry got the top job at Foggy Bottom. Ben Yount of the Franklin Center talks about citizen journalism and the tools of the at Smart Girl Summit 2013. James O'Keefe, of Project Veritas, talks about his book book, Breakthrough, at Smart Girl Summit 2013. O'Keefe explains how he began his journalistic career in college by satirizing political correctness. He also talks about his efforts to expose voter fraud. Tami Nantz led a panel discussion with Stacy Mott of Smart Girl Politics, Hadley Heath of the Independent Women's Forum, and Colleen Holcomb of Eagle Forum at Smart Girl Summit 2013. The panel discussed the failures of the GOP in the 2012 election cycle to address the concerns of women and what Republicans can do in the future. Kira Davis chairs a panel discussion with Adrienne Ross and Britteny Morrett at Smart Girl Summit 2013 about conservative outreach to minorities. The panel discusses whether reaching out to minority voters is pandering or just good marketing. Lt. Gov. Sue Ellspermann (R-IN) kicked off Smart Girl Summit 2013. Ellsperman spoke of her journey to the post of Lt. Gov. and how important it is for conservative women to run for office. Jenny Beth Martin explained the founding of Tea Party Patriots to the crowd at Smart Girl Summit 2013. After that history, she spoke about how the IRS targeted Tea Party Patriots and other conservative groups and the need to reform the IRS to prevent this kind of abuse in the future.